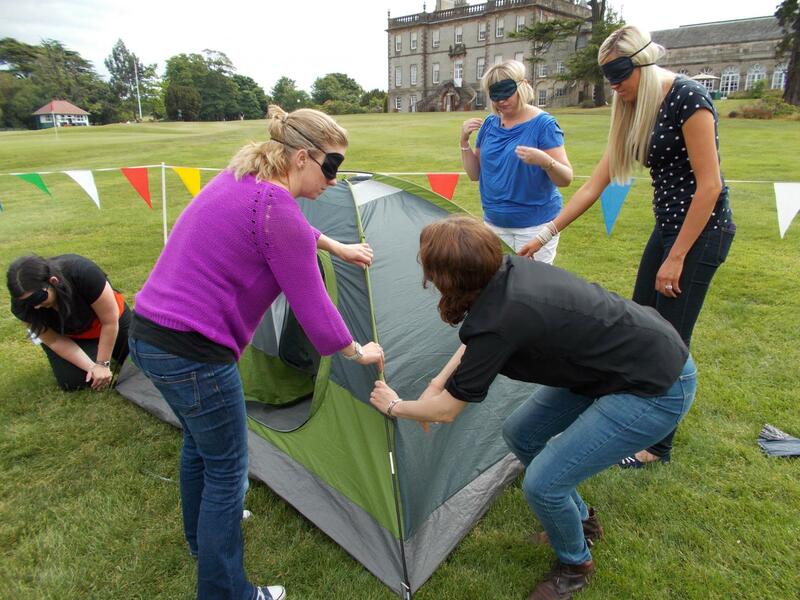 The beautiful Maryculter House Hotel by Aberdeen was the setting for our latest evening of indoor team building activities with a group of 15 from Technip offshore. The T's battled it out with team Hibs and were taking part in the Games Mania evening which included darts, big screen games, foosball, lasershot and bat the rat. The prize on offer was the illustrious Team Challenge Company winners trophy. The action got underway in incredible fashion as both teams slugged it out on the big screen games. With an epic backing from their teammates, each person gave it there all and went all out to take their team into an early lead! Claire and the remaining T's were almost out of breath after running their on screen characters into the ground! Pascal even pushed big vector into 2nd place! A remarkable feat considering the big crocs stature! Team Hibs were like grease lightening however and came out of the traps at a blistering pace. They gave the T's no chance in the early stages, romping home to victory in five out of the 6 head to heads. Hibs wanted to keep the momentum going as both teams embarked upon the darts! Hibs again showed their class (unlike their footballing counterparts) by blasting away their first three competitors and strolling into a 3-0 lead. The T's dug in and battled religiously though, remarkably clawing it back to 3-3. The deciding darts were intense! Heartbreak ensued though for the T's once more as Hibs snatched victory from the jaws of defeat with some accurate and devastating darts. Almost as devastating as Vincent's throwing technique. Javelin like was the only way to describe it. The laser shot was next up and each team rallied to post some very impressive total scores. Denise surprising a few people with her bazooka like approach. Again this game was a tight one to call as the teams fought to the death. The turning point was definitely Andy. The ex army man blew the competition away with a score of 5700. 1000 more than anyone else. Hibs recruited the sniper half way through the evening and were forever in his debt after this awe inspiring performance. Foosball greeted the teams as we entered the home straight in terms if competition. The T's badly needed a victory and along with Kelly's raucous support they achieved the dream! It was goal for goal, 8-8 until the dying seconds! It was deep into Fergie time when the T's blew the roof off with a last gasp winner! Mike taking the plaudits with a sublime finish past the Hibs goalkeeper. There was only 400 points in it as the teams faced our bat the rat finale. The rats came and went with prim and Roy in particular swinging violently but to no avail. Ian was unlucky also insisting that he 'skiffed' the rat on one occasion. Unfortunately bat the rat technology hasn't been introduced in Maryculter yet! The T's earned a much needed win however and took the points at the final hour. A fantastic last game and a great way to end the day. The top dogs were team Hibs are going down on 4400 points. The only trophy destined for a Hibs trophy cabinet this year. Well done! The T's took away the wooden spoon despite a late rally on 4000 points. A fantastic evening of fun entertainment. Thanks to Denise who organised the wonderful evening and helped the event run so smoothly.